Cantieri navali di Roma on the wake of their previous creation with an eye to the fast and conformable yachting have introduced the Itama 56, their last off spring of a bigger and lucky series. Mario Amati hand is recognizable in the various particulars one can find on board and that are the key for its increasing acceptance both commercially and aesthetically so widespread by a demanding market. The Itama 56 is an open fast commuter with a sleek and essential design and a generously fitted cockpit blending the resulting sophisticated comfort with a rational technology from the handsome aft sunbathing area to the elegant dinette to the complete steering station. A particularly safe boat access from aft is made out of teak grating. The most outstanding feature is however below deck; four full cabins with bathrooms in a 56 open footer is not easily found, considering also the careful and stylish layout achieved. 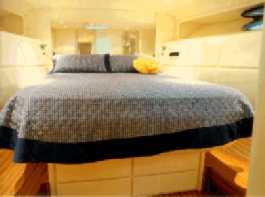 This has been longitudinally subdivided attaining a small saloon/dinette area and a rational and complete galley which centers the living space while the surrounding cabins create an effective day/night separation and guarantee the guests' privacy which results to be the boat's most gratifying characteristic. 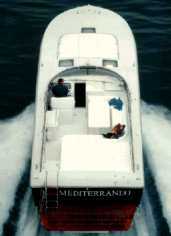 A particular mention is reserved to the sea trial where the Itama 56 has displayed an above average performance with trim and stability in line with the Itama production line : a well achieved balance between performance and living space that easily predicts the future market success for this boat. Average miles range, at a given rpm, is obtained dividing the total fuel capacity (2700 liters) for the "liters/mile" corresponding to the entered rpm. Plotted fuel consumption is declared by the engines' manufacturer: tuning of the engines, weight of persons, stores, etc... on board, hull conditions and propeller type can effect the real fuel consumption. Fore deck: windlass, cleats and fairleads, 2 hatches, sunbathing area. Cockpit particulars: steering station with pilot and co- pilot seats, U shaped dinette with table, aft sunbathing area, wet bar, aft broken bulwark access. Swimming platform particulars: teak lined deck, lockers, telephone shower, swimming ladder, hydraulic assisted gangway, 220 V shore line connection. Superstructure windows material: stainless steel, chrome bronze and toughened glass. Lay-out and main features: fore owner's cabin with double bed, wardrobes and private bathroom with shower, two twin beds guest cabins with private bathroom and shower. Wide choice of upholstery materials. Steering station: two pilot and co-pilot seats, steering wheel, complete engines monitoring instruments and gauges, compass, autopilot, GPS, echo sounder. Galley: below deck on the port side of the saloon with fully hidden work top, sinks, refrigerator and freezer, microwave oven, exhaust ventilator, furniture and hanging lockers. Chart table: located on the steering station or on the cockpit dinette. Standard equipment: water heater, three point air conditioning, safety equipment complete for 12 passengers, stereo system, 8 kW gen-set, color TV and VCR. Seakeeping: sea trial performed in optimal conditions and Itama 56 has amply proved its fast boat characteristics with a very good running trim and an excellent wave impact with a quick return retaining the optimal speed. Rudder and trim tabs response: accurate with continuous response on tight turning. Docking capabilities: very good assisted by practical mooting equipment. Deck: easy to walk with access to the bow area. Interiors: the longitudinal lay-out allow for excellent living conditions with 4 twin cabins and private baths in addition to a sophisticated saloon. 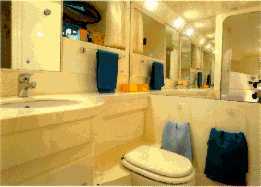 The crew quarter as well is a real cabin with an ample bathroom. 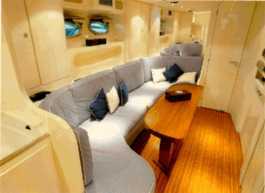 Passengers comfort: very good with a remarkable comfort and quietness during the navigation. Steering comfort: excellent with a wealth of equipment. Chart table: wide and comfortable. Galley: the American style solution together with the fittings quality is an excellent choice. 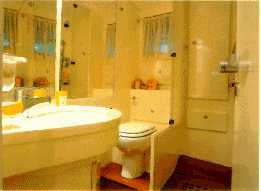 Bathrooms: one of the best feature on board. Engine room space: very good with a commendable particular eye to the safety. Electrical plant: positioned in a easy access area with excellent quality equipment. a 56 feet open boat offering 4 full cabins each with bath has inevitably posed the builder with the need to vertically develop the saloon and the galley thus reducing the available spaces in this section. 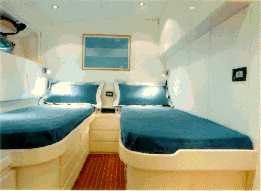 It is, on the other hand, a precise choice by the builder who had always in mind the 8 passengers' privacy and comfort.